1. Preheat oven to 350 degrees F. Lightly grease a mini muffin pan with coconut oil. 2. 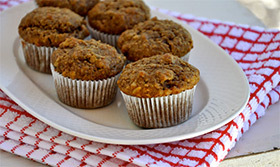 In a medium bowl combine the almond flour, flax meal, coconut flour, baking soda, salt and cinnamon. 3. In another medium bowl combine the eggs, banana, coconut sugar, maple syrup, coconut milk, almond butter and vanilla. Mix until smooth. Add the dry ingredients into the wet ones and mix well. 4. Slowly add the melted coconut oil, mix until all the lumps disappear. Add the raisins and pecans and mix well. 5. Divide the batter for 24 mini muffins. Bake for 15-20 minutes, until golden and fully set. Cool on a wire rack for 10 minutes. Store in an airtight container in the fridge.